This section will grow through 2012 and onwards. The 91 (and growing) photos are of Sedro-Woolley businesses, businesspeople and various personages are mainly from the June 30, 1960, and May 26, 1960 special insert to the Courier-Times, both rich with detail and names. You will find more than a hundred people, mostly business owners, in more than 80 photos in five parts. We originally planned one section and then it exploded. Courier Publisher Frank Evans realized back in the 1950s that the Seattle Times Sunday Rotagravure section — now the Sunday Pacific magazine — was a really good idea about instilling a sense of place, of extolling the community in a format different from the weekly newspaper. He combined the Tella-Pix photo-reproduction process with a special glossy, high-bright stock and the editions immediately became a hit. Over the years many people at history shows have given us various Tella-Pix editions, and the late Howard Miller gave us key numbers from the 1950s through '70s. Any photos that are not from that edition are identified when possible. You can find more of the editions at the Sedro-Woolley Museum in their fine library, with heavy old chairs and a marvelous wooden table, just like in the old Carnegie Library. We hope that other readers will donate more editions, or provide copies or scans. 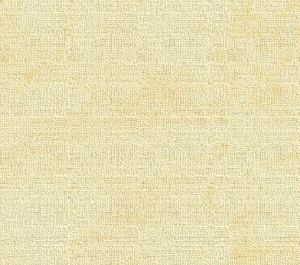 Many editions were "Progress" issues, which featured dozens of people and businesses. We especially seek those and the 1965 Progress Edition because we have only read transcripts and they are most interesting. Future editions will include Sedro-Woolley businesses in other years, along with features on communities as far flung as Marblemount, Alger, Bow and Burlington. Please share any of your memories of these stores in our guestbook below or in an email. Do you have photos of other stores in Sedro-Woolley or nearby towns? Please enjoy these stories. Service stations Do you remember all the service stations that were downtown 50 years ago? We especially want to see photos of DeHart's station, out next to where McDonald's stands today on Highway 20. We have discovered that they were from North Carolina and were related to the Jech family. I can still recall when I had a part-time job cleaning up around DeHart's. The owner at that time would have me pour used, gunky oil that had been extracted from cars during tune-ups and he showed me how to strain it through a very narrow-gauge screen into a barrel. Whereupon it was poured into label-less quart containers and sold at the station. With everyone knowing what it was. Amazing. And of course I remember when Chuck Rings and Tommy Oakes got those orange balls that screwed onto the top of antennae of all the cars that came even close to their station on State street across from the Sedro-Woolley Drive-in, now Hal's. It was considered very cool to drive your dad's car around with the orange ball waving in the wind. Do you remember these stations below? We are always looking for copies or scans of other photos of your favorite stations. Please let us know. [Click the photo for a much larger version.] This is a wonderful Tella-Pix collection of six stations you might recall. Remember how they pumped the gas, cleaned your windows, checked your tire pressure and your oil? For 25 cents per gallon? Upper Left: These are enlargements of a small panel in the 1960 issue and are still a bit blurry. This is the Chuck Rings station that we recalled above. See in the background the smokestack from the Sedro-Woolley Laundry, still across the street on Murdock. Upper Center: Huggins Texaco, still in the northwestern corner of the Mission Market at that point, where the Chinese restaurant has graced us with really fine food for more than twenty years. At that time, you drove under the overhang on a diagonal to fill up your pump. Upper Right: Cargill Mobil Service, also called Cargill and Lisherness. It opened in 1937 on the site of the old Hotel Royal/Vendome Hotel (see below) and when its successor closed in the early 1990s, the site became abandoned lots at the southeastern corner of Ferry and Eastern. Like its counterpart station downtown where Hammer Square is today, the tanks underground had long been leaking for years so the spot stayed undeveloped for many years, with a smoke shop located there for a while. After Leo Hayes started a brief car wash on the site, it is empty again. 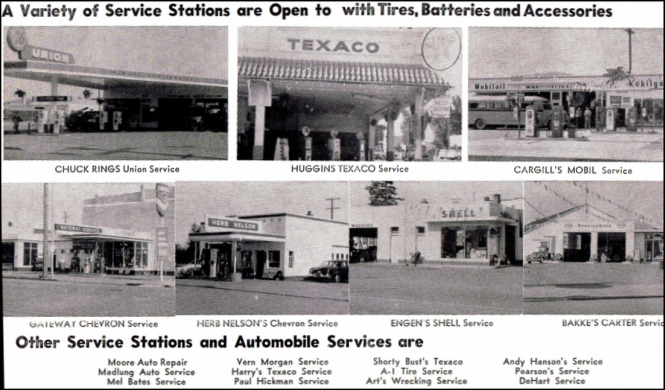 Lower Left: Herb Nelson Chevron Service. Then on the busy corner of Borseth running south to north and Ferry, running west to east. Still there now, the first service station a driver finds upon entering the city. And still a service station. Lower Center: Engen's Shell Service. We are stumped on this one. Can you remember? The lower list. We remember Harry's Texaco, at the northeast corner of Fourth and State streets, where an auto-related business is still located. We remember Art's Wrecking, down by the river where the Clark & Lennon mill stood in the days around 1900. DeHart was located on Highway 20, as we noted, simply the Burlington Highway back then, or the Dollar Way to old-timers. We remember the names of the others, but not where they were. Do you know? We remember a station on the north side of the Great Northern tracks, at Township street. We remember another at the southwest corner of Ferry and Township streets, which is now a residence. And another in the triangle building, where State forks off, either to the Minkler Highway or the Hoehn Road. And the old station and house at the dead-end corner of Cook road and Borseth street, now Highway 20. 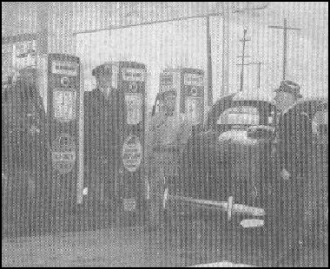 Do you have photos of any of those or any of the other service stations? Maybe some we have missed in this section? This is a photo of when the Cargill location opened as Greenstreet & Gribble's Gillmore Red Lion station in 1937. See this story for that news item and others from the Courier-Times through the years. 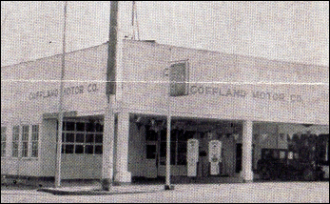 Charles Coffland's Coffland Motors, at this time located at the corner of Murdock and Ferry streets, now the site of Skagit State Bank. Coffland and Latting families. Helen Ann Latting Hansen kindly provided me a lovely summary of her family and her memories of those days around 1960 in Sedro-Woolley, which we will soon feature in a Coffland profile. She is the daughter of Allen H. "Sandy" Latting. As she reminded us. Charles Coffland was the owner of Coffland Motors and married for a number of years to Agnes Latting, the mother of Allen Latting, Donald Latting Sr. and Thelma Long. I remember the station so well because it was across the street from the American Legion, which was the center of our family life and one of the main social centers in town back in the 1950s and '60s. Helen reminded me that in the 1970s Charles Coffland moved his used car dealership from the location on Murdock (now the site of Skagit State Bank) out to the north side of Highway 20. He built a new garage there, as Joe Hamel also did, both showing they were prescient about the future traffic skirting downtown. & built a new garage out on Highway 20 beside it sometime in the early 1970s. Stan Nelson's Nelson Chevrolet was a town landmark from 1938 onwards when he and his family bought the original from Dad Abbott, who also owned and founded the Dream Theater across the street. We are still investigated to the apparently short-lived partnership as Fraser Motors in the late 1950s. 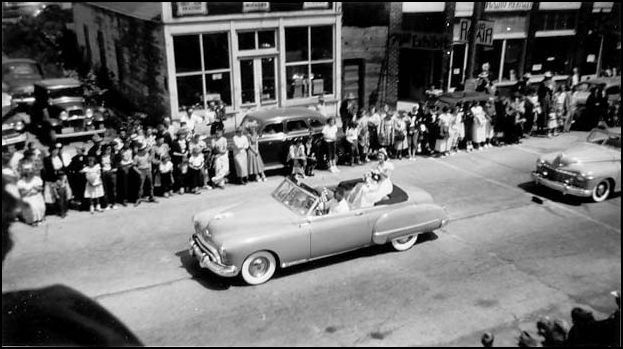 Hamel Pontiac was on State street, across the street from the Baptist church where the glass shop stands today. That was a long-time favorite of my family; we bought three Pontiacs there, including a beautiful white 1954 model and my favorite, the purple 1959 with fins. Joe Hamel grew up in Saxon and once managed the Piggly Wiggly grocer downtown. 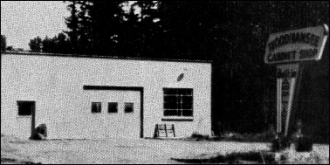 Valley Auto is at the same location that it is today, on West Ferry street, in the same basic building. Gone are the houses that used to stand next to Valley to the east. Larry Stave's old service station at the southwest corner of Third and State streets was very historic. It evolved over the years from the service station they opened in 1919, across the street where the city parking lot is today. That was the first such station in the city, followed soon by LaPlant's station at Cook road and Borseth. I remember them for two things. First, for when Stave also had the Oldsmobile dealership and I could run my hand along the body and fins of those classic old Rocket 88s, and sometimes even sit in the driver's seat. 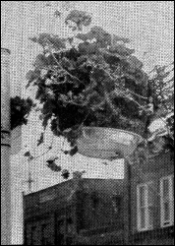 Second, I recall that Stave started the tradition of hanging planters downtown. The old showroom where the Rockets gleamed was most recently the home of Contractors and Loggers Supply. Since that business closed, the building is for sale and used a few days a month for flea markets. 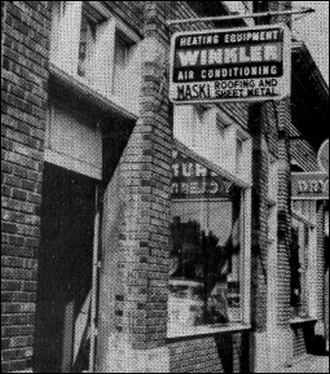 Above Left: Sedro-Woolley Laundry and Dry Cleaners was at the northwest corner of State and Murdock streets and the chimney dominated the downtown district. It burned in 1965 and eventually the whole row of early-20th century buildings were razed for parking, including the original Opera House/Moose Hall. We still hope that a reader will have interior photos of the laundry or photos during the fire and the rubble that remained of the buildings. For instance, did the auto parts store and the old Moose Hall/Opera House burn too? Or did they survive and were they razed sometime after the fire? Above Right: This is a photo of the hanging baskets that we mentioned. So we know that the tradition started more than 60 years ago. 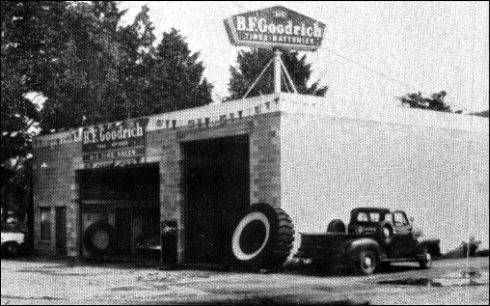 Berglund Ford, as the dealership originally looked, 11 years after Sig Berglund moved his business to West Ferry street. Eventually razed for the property were the original Frazee Hospital, the St. Charls Hotel, a small grocery, a small motor court and Lentz & Nelson Feed and Seed. It was just a few yards west and south from the site of P.A. Woolley's original mill in 1890. We plan to profile Berglund soon, the Norwegian immigrant who became a logger, a barn-storming pilot and the vice president of a Swedish airline. Wally Tresner, a descendant of the Tresner family famous for an early harness business, the Mission Market and a taxi service, owned Skagit Glass and Upholstery. Can you remember the exact location?. 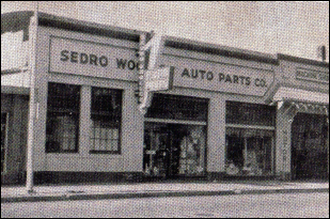 This was the Huggins Bros. Sedro-Woolley Auto Parts, located at the northern head of Third Street, where the city parking lot is today. They opened in an auto parts/service station across the street in 1938, today's Mission Market. The Chinese Restaurant is in the corner where cars used to drive in for gas and service. This photo was taken from the top of one of the buildings on the south side of State street. It shows the north side of the 200 block of State Street in Sedro-Woolley during a Loggerodeo parade sometime in the 1950s. To get your bearings, imagine that the old J.C. Penney & presently a furniture building is to the left. The woodframe building with the tall, vertical panes of glass is the Pressentin Plumbing shop. Then there is a wooden doorway to the right, between the Pressentin building and the Opera House/Moose Hall, which has the brick front and a sign hanging out front, "Radio Repair." To the right, or east, would be the Huggins Auto Parts shop and then the Sedro-Woolley Laundry. Can any of you remember the exact date that the laundry and buildings around it burned, circa 1965? We hope that by posting these photos, a reader will recall details about all these buildings and specifically the old Opera House, which was apparently raised in 1972. See three more photos below. Unfortunately, these are the only views of the Opera House building and we hope that a reader will scans with a better view of it. Courtesy of Dale and Marilyn Thompson. This is the close-up view of Charlie Pressentin's sheet-metal and plumbing and hearting business. Charlie and his brother Otto, who became a partner after returning from his walks back and forth to British Colubia, were getting a little longer in the tooth by now. They were sons of Karl von Pressentin, who brought his growing clan to Birdsview from Wisconsin in 1878. Both brothers were known for their amazing physical strength. Several old timers recalled seeing one or the other brother bicycling to visit a customer, with a hot water heater strapped to his back. 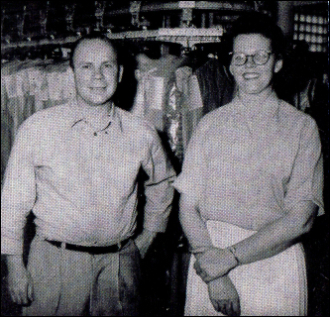 Harry Dean and his wife owned Best Cleaners, in the building at the northwest corner of Third and Warner streets where Cascade Fresh is located today. I remember this business better than the Sedro-Woolley Laundry a block to the north. We hope that a reader will have photo of the interior and the "24-Hour Martinizing" section. They also had machines where patrons could do their own dry cleaning. 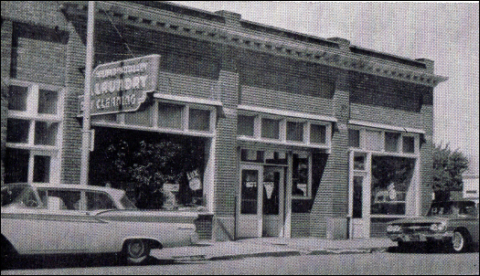 Harry Friedrich and his family owned the A-1 Tire sales at the southwestern corner of Jameson and Third streets. Only an expanse of lawn remains today. This is a very historic location. Just across the street was a row of businesses clustered around new Sedro, centered on the present high school location. Friedrich then had the only tire-recapping plant in the valley. Above: Woodmansee Cabinet Shop was located at the eastern dead-end of Ferry Street. The concrete block building was originally the home of Selix Chrysler-Plymouth from their old site on Third street sometime before my father bought our 1953 Plymouth there. Does anyone remember what happened to that dealership? Was it out of business by the time the photo was taken in 1960? 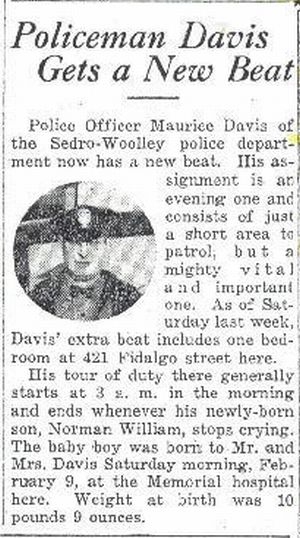 Right: Someone very familiar about town was policeman Maurice Davis. I grew up with his sons Norm and Chuck and they have shared a fascinating family history. Maurice's father died after his legs were amputated in a railroad accident and Maurice became effectively an orphan. He was adopted by the C.O. Davis clan of the Clear Lake/Day Creek area. Maurice first worked as a chauffeur for banker Charles E. Bingham, before eventually becoming a policeman. This photo is actually the birth announcement for Norm, back in 1946. Our new portal section to Photo specials about old Sedro, Woolley and Sedro-Woolley, based on Tella-Pix, a process that Frank Evans employed at the old Courier-times in Sedro-Woolley. Many links already and growing by leaps and bounds in the New Year.